The middle of February might seem like the doldrums of winter, but it’s been a hotbed of activity for girls and women’s hockey. During the weekend of Feb. 15, the International Ice Hockey Federation (IIHF) held its fourth annual Global Girls Game, an initiative featuring federations from approximately 40 countries hosting games in succession around the world to celebrate girls’ hockey. In conjunction with the event, the Rivalry Series between the women’s national teams from the U.S. and Canada took place throughout the week. Canada took two of the three games in the Series, shutting out the U.S. team 2-0 in the finale Feb. 17 in Detroit. The United States chose this as its feature game for the IIHF Global Girls Game. USA Hockey held its own National Continuous Game around the United States featuring girls and women’s teams from the 8U level through the collegiate ranks. Specific girls games from teams across the country were selected as part of the initiative leading up to the United States Girls Global Game which took place between U.S. and Canada on Feb. 17. The Lake Forest (Illinois) Scouts played Evanston in one of the games Feb. 15. 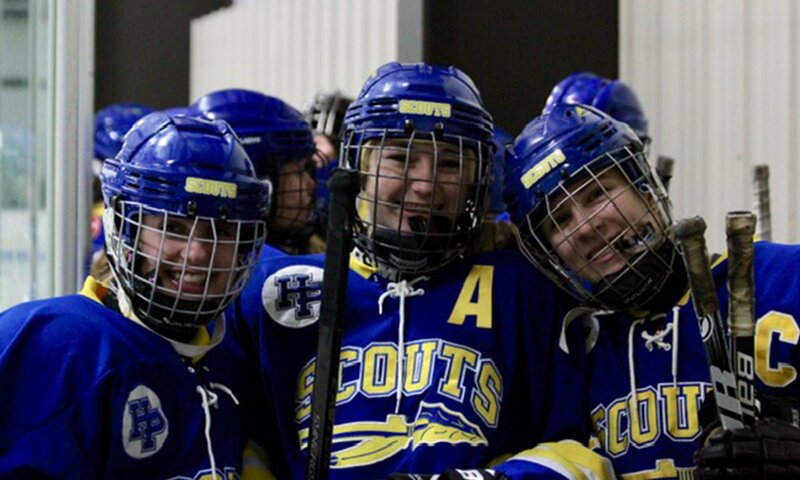 After trailing 3-0 in the first period, the Scouts rallied with nine unanswered goals for a 9-3 victory. Besides Lake Forest High, girls from Stevenson, Libertyville, Highland Park and Deerfield make up the roster, which ranges anywhere from 18 to 24 girls each season. Zorn and Laura Danforth share head coaching duties. During games, Zorn handles the forwards, while Danforth coaches defense. According to Danforth, it’s an ideal arrangement for everyone. Both women have been with the Scouts since the 2012-13 season, the same year the team won a state championship. In Illinois, players are allowed to compete on both travel and high school teams if they wish. The experience level of the Scouts ranges from girls just learning the game to those ready to play in college upon graduating. Having a variety of skill levels makes teamwork critical, Danforth explains. Jacque Rogers, a goalie for the Lake Forest College Foresters, assists Zorn and Danforth as a goalie coach. She was unable to attend the Scouts’ game with Evanston because her own team was also part of the U.S. National Continuous Game, losing a tough 2-0 decision to St. Scholastica the same night. Rogers, a junior, remembers watching Scouts practices during her freshman year at LFC. Seeing the smiles on their faces and the camaraderie they shared motivated her to become a part of the club. “I have always dreamed of being a hockey coach, and I couldn’t have been more excited to join such a great program,” said Rogers, who was born in Marysville, Michigan, and fell in love with hockey at an early age watching her brother play. As a girl growing up in upstate New York, Zorn played pond hockey in her own backyard, literally. She played on boys teams until eighth grade before joining a girls travel team. Danforth was born outside Detroit, and began playing hockey at the age of 4. Her interest was sparked by her older brother, who began playing a year before she did. Zorn and Danforth met while playing at Cornell University. After graduating in 2010, the two women moved to Chicago and began coaching. Ironically, Cornell’s Feb. 15 conference game against Brown was also designated by USA Hockey as part of the U.S. National Continuous Game (the Big Red won, 4-1). Both women are optimistic about the growth of girls and women’s hockey going forward. This past summer, Zorn interned at USA Hockey’s Girls 15 National Player Development Camp. She credits programs like these for getting young girls interested in the sport. “USA Hockey does an excellent job in training their young athletes and getting them involved in promoting positive aspects of the game, including nutrition, physical and on-ice development, and mental development,” Zorn said. For Danforth, initiatives like the IIHF Girls Global Game go a long way to promote excitement.